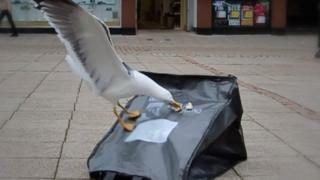 "Gull-proof" rubbish bags are to be tested as a way of tackling the nuisance caused by urban birds. About 40 households and businesses in Dumfries are being asked to take part in the experiment. They are concentrated in a small area so that Dumfries and Galloway Council can monitor the impact. A six-month trial is planned and if it proves successful the use of the bags could be extended to other properties currently using ordinary refuse sacks. The large, heavy mesh bags will be given out to businesses and houses willing to take part who are currently provided with waste sacks rather than wheeled bins for their rubbish. They can then put their ordinary refuse sacks inside the big bags which will be emptied by bin lorry workers and then returned for re-use. Archie Dryburgh, who chairs the council's economy, environment and infrastructure committee, said: "There is no doubt that gulls continue to create misery for many people and we recognise this. "We know they are attracted to litter, that's why we ask people to dispose of their waste appropriately." Communities committee chairman Andy Ferguson also endorsed the move. "Unfortunately, gulls have learned where to find food sources, so we are rolling out these trial bags to see if this will deter them from creating havoc by pecking and spreading waste, thereby attracting even more birds," he said. "If successful we hope to roll this out in other problem areas across the region in the future."